Deep Space Nine first aired in January 1993, on CBS. When compared to the original series and The Next Generation, Deep Space Nine was described as “dark,” “edgy,” and “the black sheep” of the Star Trek family, a show that did not fit in Gene Roddenberry’s vision of the future. But a large and passionate fanbase was watching: the show lasted and impressive seven seasons. Now, 20 years after it left the airwaves, fans all over the world continue to watch Deep Space Ninewith the same affection they feel for the other Star Trek series. 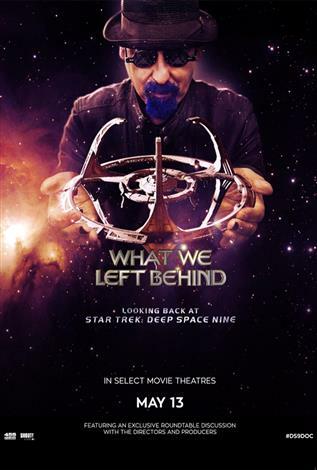 Through extensive interviews with cast and creators, show footage presented in HD for the first time anyway, and brand-new animated storyboards showing what could have been and what still might be, directors Ira Steven Behr (showrunner of the original series) and David Zappone (Star Trek docs The Captains and For the Love of Spock), bring you What We Left Behind: Looking Back at Star Trek: Deep Space Nine, an in-depth look at this beloved show, its fans, and its ongoing appeal to Trekkies of all ages.